Design, Development and Manufacturing of Temperature Control Chiller Systems for Custom One-Off Applications and High Volume OEM’s. 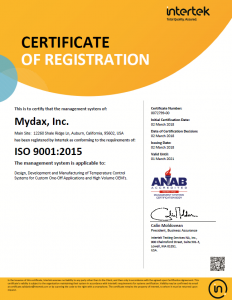 Mydax stands apart from other liquid chiller manufacturers by providing the elite chiller system on the market, utilizing patented proportional refrigeration control, rugged tubular steel frames, brazed piping and state of the art touchscreen controls. Expert use of flowmeters, pressure transducers, pulse width modulated valves and variable frequency drives allow precise temperature and fluid flow control. Copyright 2018 Mydax Inc. | All Rights Reserved | Do not duplicate or redistribute in any form.